SAVE THE DATE: Keynote dinner with Danny Glover on October 13, 2018. 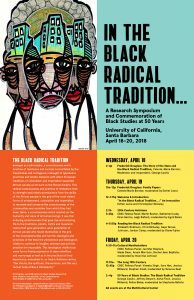 UCSB Alumni and the Department of Black Studies of the University of California at Santa Barbara are proud to announce our fall celebration North Hall Takeover 50 Years After honoring the 12 students who, on October 14, 1968, took over the North Hall building to demand change in the curriculum and climate on campus for Black students. In response, then Chancellor Vernon Cheadle began a process of institutional change that resulted in the founding of the Department of Black Studies, the Chican@ Studies Department, the Center for Black Studies Research, and eventually the Departments of Asian American Studies and Feminist Studies with other research and curricular apertures to study inequality and a multicultural world. The energetic vision of these original 12 students also embodied the hope that all Black students in the state of California would have an excellent chance to attend its flagship university system in a world free of racism, fascism, and misogyny that nurtured equitable, spiritually meaningful lives. This conference is an opportunity not only to reflect on the importance of the North Hall Takeover, but also to think seriously about how we can create a better future for Black students, and consequently for all students, at the university. 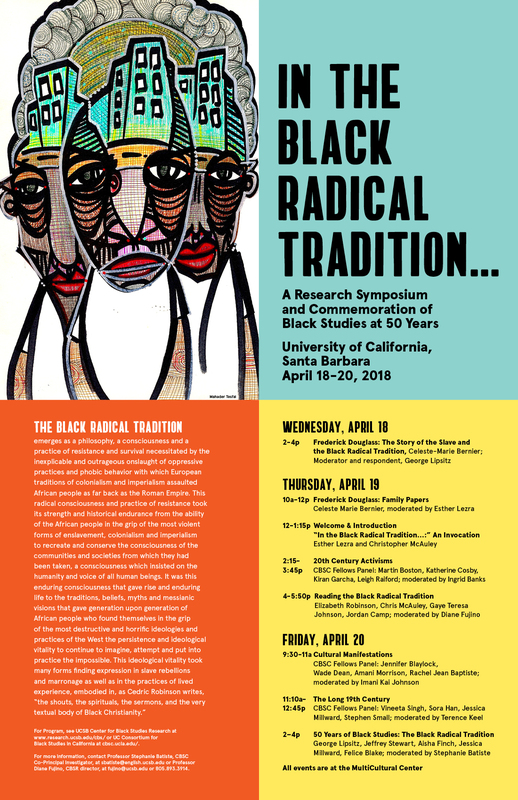 The conference is organized by Jeffrey Stewart, professor of Black Studies, and will be held on the weekend of October 12-14, 2018 at UC Santa Barbara, in coordination with the UC Santa Barbara Alumni, Admissions Office, Division of Social Sciences, Educational Opportunity Program, MultiCultural Center, UCSB Library and the Office of the Chancellor. Accordingly, this conference encourages past, current and prospective students to attend to help us explore ways in which the university can give students the knowledge they need to make a difference in their communities in terms of social medicine, cultural awareness, and human sustainability. The highlight of the conference will be a keynote dinner on October 13 with Danny Glover, renowned actor and humanitarian. Mr. Glover will reflect on the importance of social commitment along with individual success in a life well-lived. We welcome the public, students, and professionals at large seeking social innovation and livability through the lineages of progressive education. On the campus of the University of California at Santa Barbara. “What role should the Center for Black Studies Research play in enhancing Black Student Success at UCSB? The Black Radical Tradition emerges as a philosophy, a consciousness and a practice of resistance and survival necessitated by the inexplicable and outrageous onslaught of oppressive practices and phobic behavior with which European traditions of colonialism and imperialism assaulted African people as far back as the Roman Empire. This radical consciousness and practice of resistance took its strength and historical endurance from the ability of the African people in the grip of the most violent forms of enslavement, colonialism and imperialism to recreate and conserve the consciousness of the communities and societies from which they had been taken, a consciousness which insisted on the humanity and voice of all human beings. You can find the full program and schedule of events here. our stories and our bodies reveal our deepest humanity, power, and joy. vulnerability, life challenges, embodied stories, family history, and intention. *Participants: You may find a detailed schedule, travel and hotel information, and optional supplemental readings and videos here. Please join the Hemispheric South/s Research Initiative for our newly rescheduled first event of Spring Quarter! on Wednesday, April 27 at 12:30pm in the Dolores Huerta Room in South Hall 1623. The former Associate Director of the Women’s Research & Resource Center at Spelman College, she has received several grants and fellowships for her work, most recently being awarded fellowships from Emory University’s James Weldon Johnson Center and the Schomburg Center for Research in Black Culture. 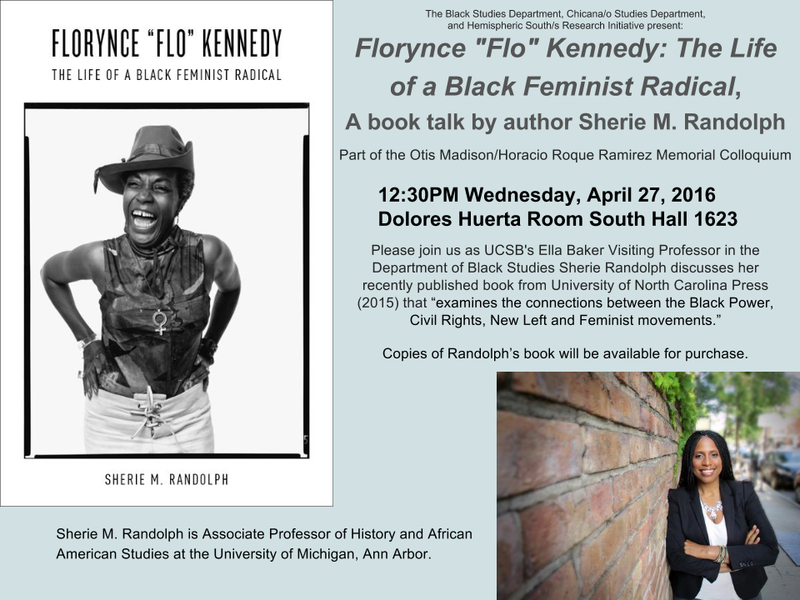 Randolph’s book, Florynce “Flo” Kennedy: The Life of a Black Feminist Radical (University of North Carolina Press, 2015), examines the connections between the Black Power, civil rights, New Left, and feminist movements. We look forward to you joining us for this exciting event. 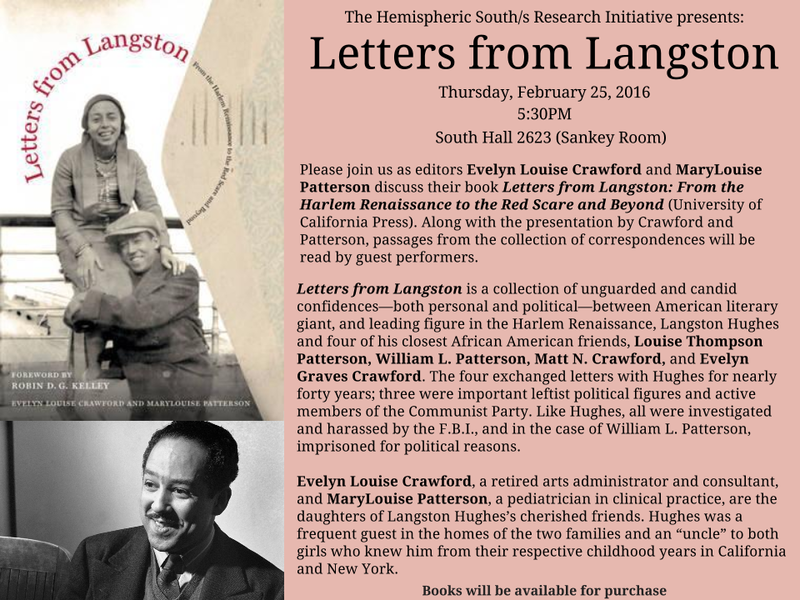 Please join us on Thursday, February 25 at 5:30PM at South Hall 2623 (The Sankey Room) as editors Evelyn Crawford and MaryLouise Patterson discuss their book Letters from Langston: From the Harlem Renaissance to the Red Scare and Beyond (University of California Press). The editors will share memories of “Uncle Lang,” their activist parents, and their meticulous compilation of the edition. “Letters from Langston is a collection of unguarded and candid confidences—both personal and political—between American literary giant, and leading figure in the Harlem Renaissance, Langston Hughes and four of his closest African American friends, Louise Thompson Patterson, William L. Patterson, Matt N. Crawford, and Evelyn Graves Crawford. The four exchanged letters with Hughes for nearly forty years; three were important leftist political figures and active members of the Communist Party. Like Hughes, all were investigated and harassed by the F.B.I., and in the case of William L. Patterson, imprisoned for political reasons. Letters from Langston begins in 1930 and spans the succeeding decades, ending shortly before Hughes’s death in 1967. The two couples share their lives of political activism and the everyday joys and sorrows of family life with their friend Langston. He, for his part, savors their affections, companionship, and support during his own struggles as an often-misunderstood ‘literary sharecropper.’ This distinctive volume of correspondence captures stories of friends and family, living in an era of uncertainty and sharing a vision of an idealized world—one without hunger, war, racism, and class oppression. 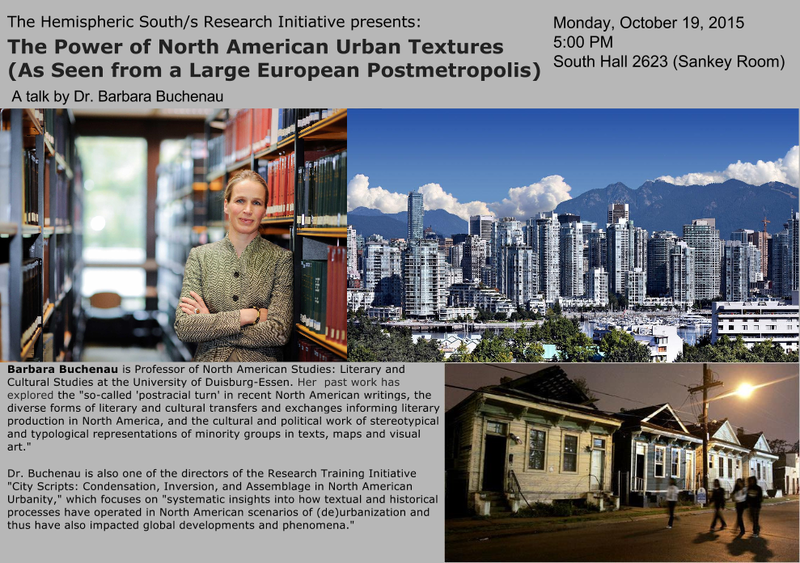 On Tuesday, October 20 at 2:00pm in South Hall 2635. 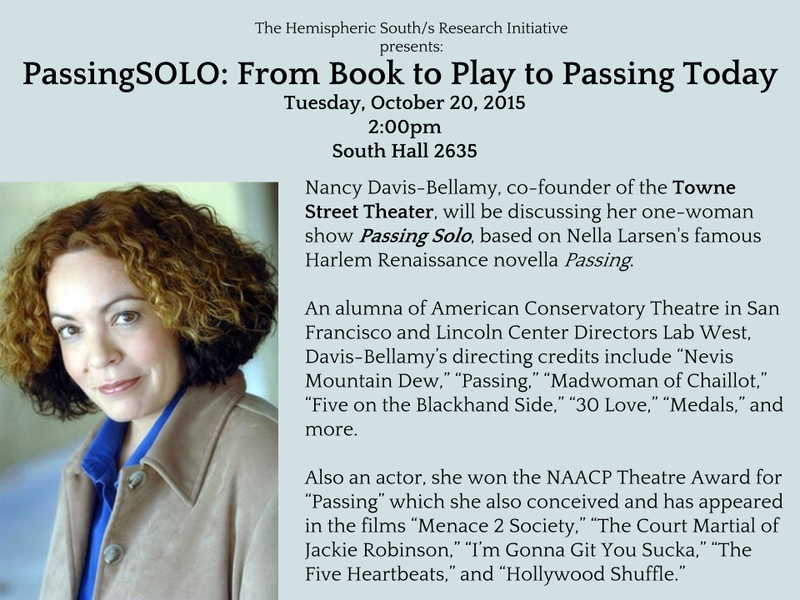 Nancy Davis-Bellamy, co-founder of the Towne Street Theater, will be discussing her one-woman show Passing Solo, based on Nella Larsen’s famous Harlem Renaissance novella Passing. 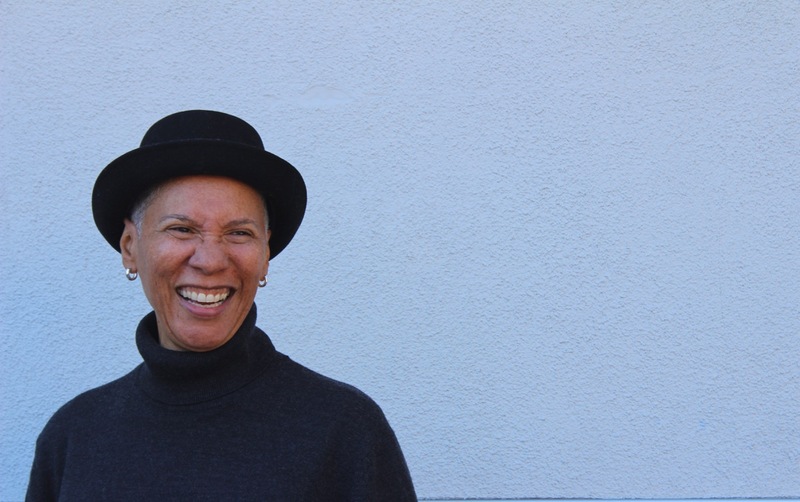 An alumna of American Conservatory Theatre in San Francisco and Lincoln Center Directors Lab West, Davis-Bellamy’s directing credits include “Nevis Mountain Dew,” “Passing,” “Madwoman of Chaillot,” “Five on the Blackhand Side,” “30 Love,” “Medals,” and more. On Monday, October 19 at 5:00pm-6:30pm in the Sankey Room (South Hall 2623). Join Chican@ Studies and Hemispheric South/s in welcoming Virginia Grise, a Chicana cultural worker and theater artists and recipient of the 2013 Whiting Writers’ Award, 2010 Princess Grace Award in Theater Directing, and 2010 Yale Drama Series Award, to UCSB. 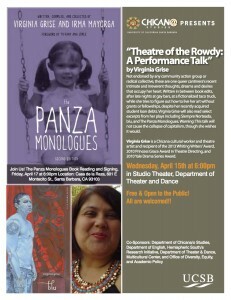 Grise will give a performance talk titled “Theatre of the Rowdy: A Performance Talk” on Wednesday, April 15 at 6 p.m. in the Studio Theater, Department of Theater and Dance. 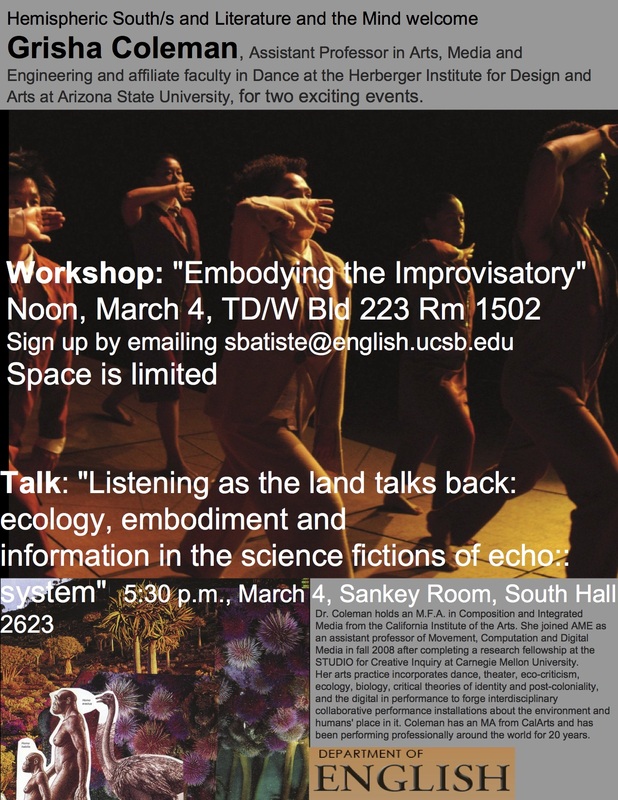 The English department’s Hemispheric South/s and Literature and the Mind initiatives are excited to announce a workshop and talk by Grisha Coleman, Assistant Professor in Arts, Media and Engineering and affiliate faculty in dance at Arizona State University. 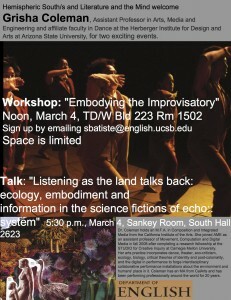 The workshop is organized around “Embodying the Improvisatory,” and will take place next Wednesday, March 4 at noon. Please see the attached flyer for more details about the RSVP and location. Space is limited. 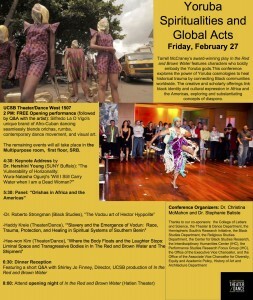 Hemispheric South/s and the UCSB department of Theater and Dance announce the Yoruba Spiritualities and Global Acts Conference. Tarrell McCraney’s award-winning play In the Red and Brown Water features characters who boldly embody the Yoruba gods.This conference explores the power of Yoruba cosmologies to heal historical trauma by connecting Black communities worldwide. The creative and scholarly offerings link black identity and cultural expression in Africa and the Americas, exploring and substantiating concepts of diaspora. 2 PM: FREE Opening performance (followed by Q&A with the artist): Silfredo La O Vigo’s unique brand of Afro-Cuban dancing seamlessly blends orichas, rumba, contemporary dance movement, and visual art.